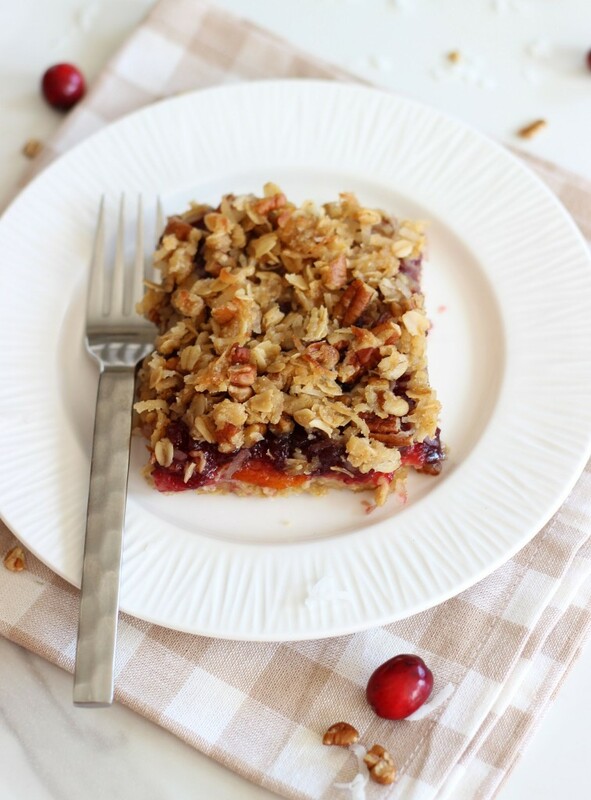 These Cranberry Orange Coconut Oatmeal Cookie Bars feature a brown sugar, oat, coconut, and pecan streusel crust, with an easy filling of whole berry cranberry sauce, orange marmalade, and coconut! Over the weekend, I was confiding to S.O. that some days words flow freely as I’m writing and I could ramble on for hours. Other days, I’m a total blank. I got nothing. He looked at me, and without missing a beat, he said: “When you change the way you look at things, the things you look at change.” He was dead serious. Lol! I was… flabbergasted. I didn’t even know what to do with that! Or how to translate it to my situation! Not to say it wasn’t helpful, but I still didn’t know what to do with it. Maybe I’m just not ‘deep’ enough? I was also beyond stupefied that it came out of his mouth! Well, apparently it came out of Dr. Wayne W. Dyer’s mouth first (who?? ), but for S.O. to repeat it took me by surprise. He’s incredibly smart, sure, but I’ve never known him to drop quotes like that in an instant. So while I did endlessly chat, I said nothing about these bars. Eeek, sorry. Here we go: they’re truly a cinch to make, and pretty quick at that. They’ll really stand out at your dessert table next to usual suspects like pumpkin pie! Although there is NOTHING wrong with a traditional pie! 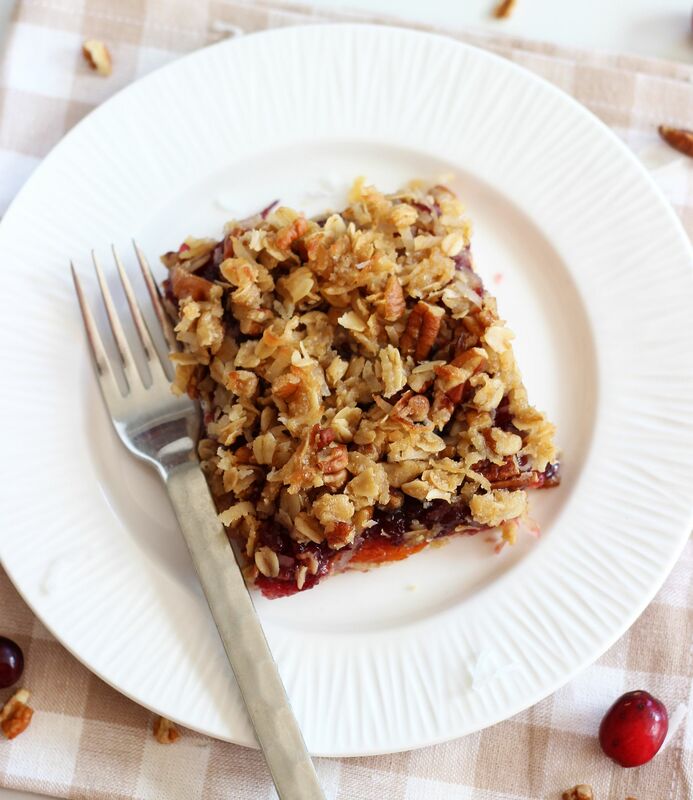 These Cranberry Orange Coconut Oatmeal Cookie Bars pack so much brown sugar, pecans, and oats in a buttery crust, and a thick ribbon of a cranberry, orange, and coconut filling! They’re completely delicious, pretty, and totally unique! These are a sure hit at your Thanksgiving feast! 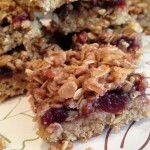 An oatmeal, brown sugar, coconut, and pecan cookie bar with a cranberry-orange filling! In a large mixing bowl, cream 1 c. butter and 1 c. brown sugar until light and fluffy. 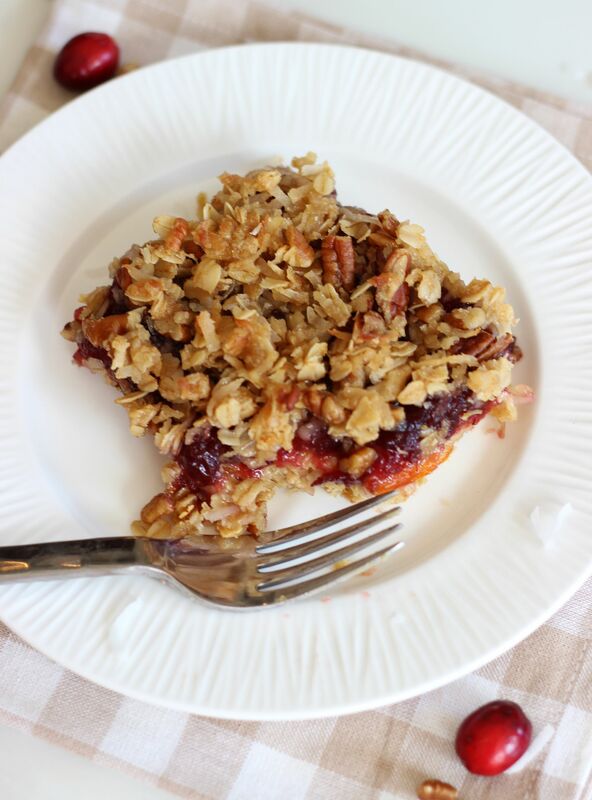 In a small bowl, combine 2-1/2 cups oats, 1/2 c. coconut, and flour. Add to mixing bowl and beat until thoroughly combined. Press into a lightly greased 9x13 baking pan. 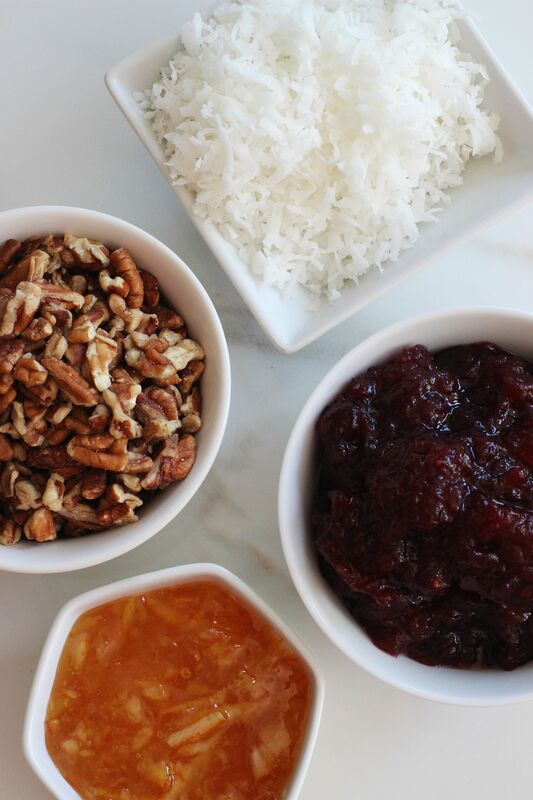 In a medium bowl, combine cranberry sauce, orange marmalade, and coconut extract. Mix well. In a small bowl, melt the remaining 1/4 c. butter in the microwave. Stir in the pecans, and remaining 1/2 c. brown sugar, 1 c. oats, and 1/2 c. coconut. Sprinkle over cranberry mixture. Bake at 375° for 25-30 minutes or until lightly browned. Cool on a wire rack. I absolutely love that second picture of the four little bowls of ingredients. It’s so nice to have a visual of exactly what goes into the recipe, especially when the colors and textures are as wonderfully varied as this one. Oh good! I’m never sure if people like to see things in progress. Maybe then the recipe writes itself through the pictures! I posted some ingredients in action yesterday too – did you see? 🙂 You’re right, this does have a lot of textures and color to highlight! I’m totally the same way at times, Sarah! Sometimes I know what I want to write as I’m making the recipe. Other times, I get writer’s block and have to come back to it later. Sounds like you got some good advice, though! Such a good “deep thinking” quote! 🙂 Now onto these oatmeal cookie bars…amazing! 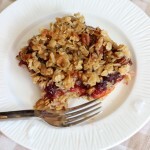 I’m in love with the crumbly topping. And the cranberry, orange, and coconut flavors sound delicious! Love it! Isn’t that funny? He just busted it out one me in an instant! Haha! Some days it’s hard to chat, some days it is super easy. I never know! The three flavors together are really wonderful. I loved how fresh and fruit they were! Thanks, Gayle! 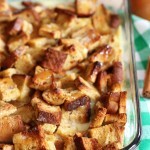 I might just have to make these for Thanksgiving! I already have all of the ingredients and they look incredible. I wish I had one right now to snack on! I’m exactly the same way, some days the writing feels natural – others, not so much! Oh well. 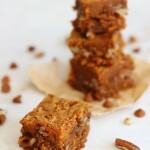 These bars look incredible, I love that streusel on top, it looks so crunchy. Yum! I feel the same way about writing some days too. Getting out all your Christmas decorations sounds like a great idea to clear your mind 🙂 Especially if you get to munch on these bars at the same time, they look incredible!! Wow these look incredible Sarah! 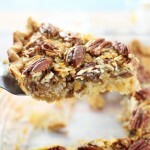 I love coconut, pecans, orange marmalade…mmmmmmmmmm! and I guess it happens with everyone..sometimes we just don’t know what to write…happens with me very often! Pinning this! Coconut? I’m in! That’s all I need to hear! these look amazing! Thanks so much!! They’re pretty darn festive! 🙂 Happy Thanksgiving to you! Love all the ingredients in this bar! 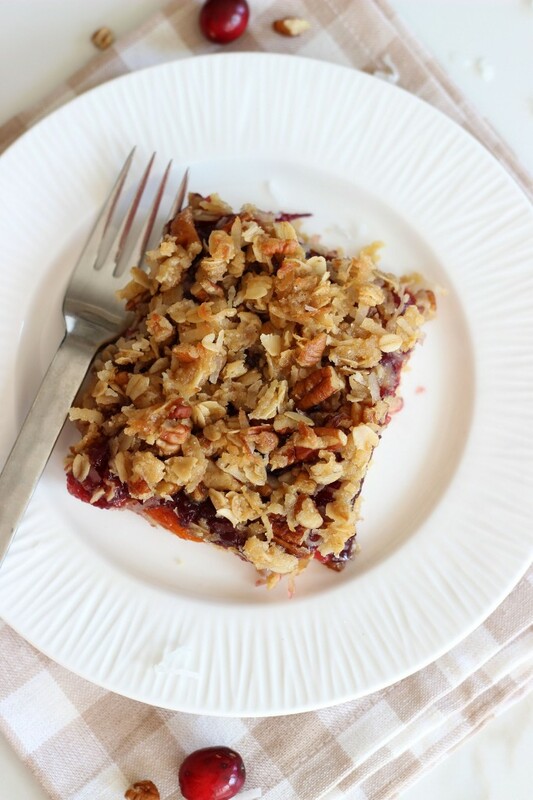 Orange, cranberry, coconut and oatmeal.. sounds so yummy together in a bar 🙂 I’m going to try this.. such a healthy breakfast or a snack. BTW, visiting you from Think Pink Sunday! Thanks so much for stopping by, Vidya! 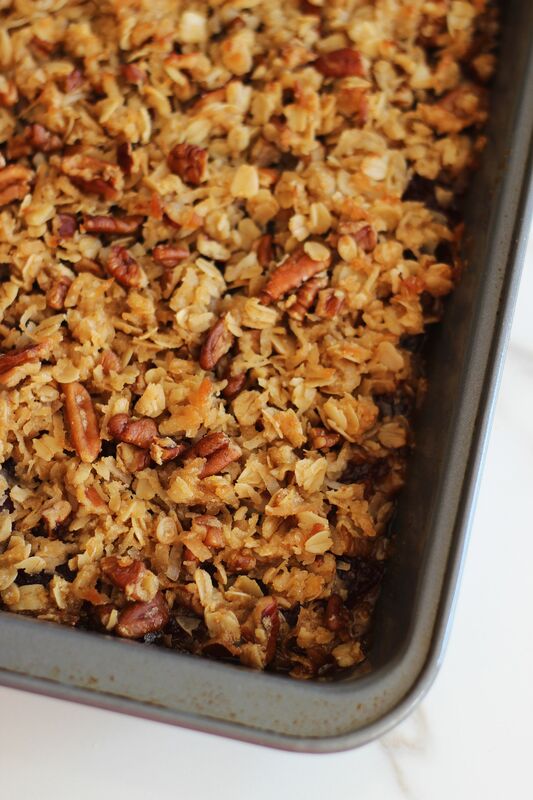 The bars are delicious – so many great holiday flavors wrapped into one recipe!